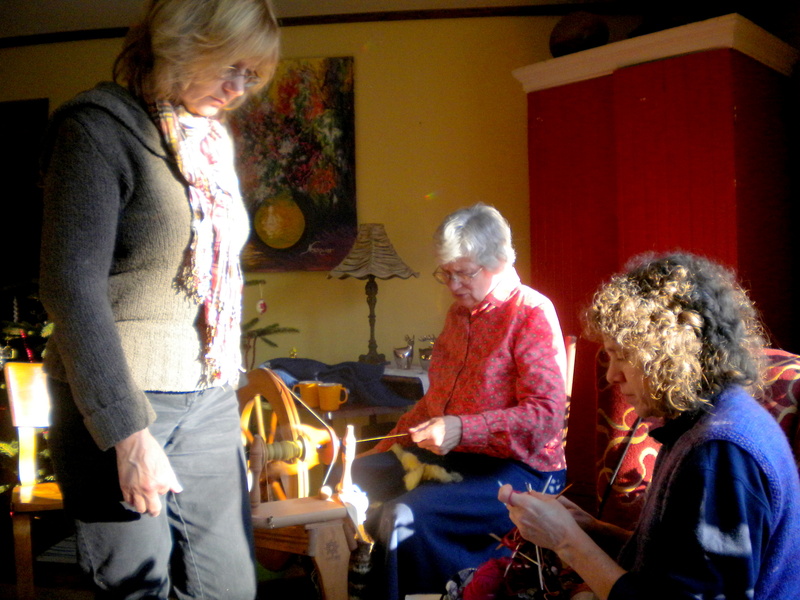 I deliberately sat beside my friend, Katy, at a solstice party recently because she was cozingly ensconced at the end of a sofa – knitting. It’s been, most likely, two years since I knitted and just hearing the click and swish of the needles and watching the teal and green threads weaving into a mini-creation and feeling the hypnotic comfort of the process made me yarn hungry. And so, yesterday, I drove out to Katy and Ron’s place at their 100 acre woods, where I had to park somewhat down the drive because I could see that the cars were filling the spaces closest to the house. As I struggled up the road, laden with baguettes and pasta salad, balancing my purse and knitting bag, trying not to slip in the slushy snow, I noticed a large, very large brown creature ahead. Looking directly at me and SNORTING. It was too big for a dog. Certainly. More the size of a large calf. Perhaps. But snorting? There are two wild animals of which I am most afraid. Bears and wild pigs. I have never encountered a bear, I am relieved to admit, but the very possibility of their presence on the trails of Yosemite has made our forays there less pleasurable for me. The wild boar is another story, closer to home, for they were common in the hills of Big Sur where we lived for a time, aggressive and not to be encountered if one could help. 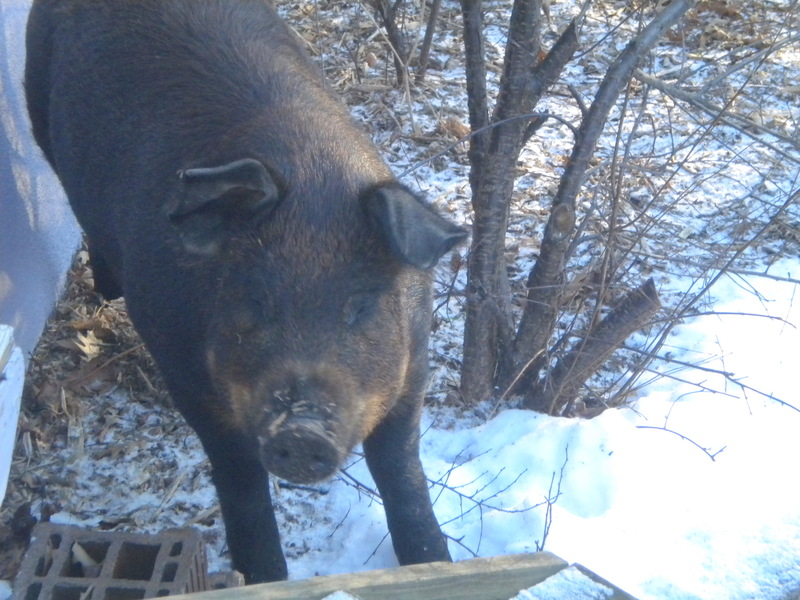 So it was with some trepidation, I must admit, that I determined that the snorting creature who was now looking intently at, and moving directly towards me – was indeed a pig. This WAS, after all, the hundred acre woods. I wrestled briefly with the idea of getting back into the car and driving quickly away. 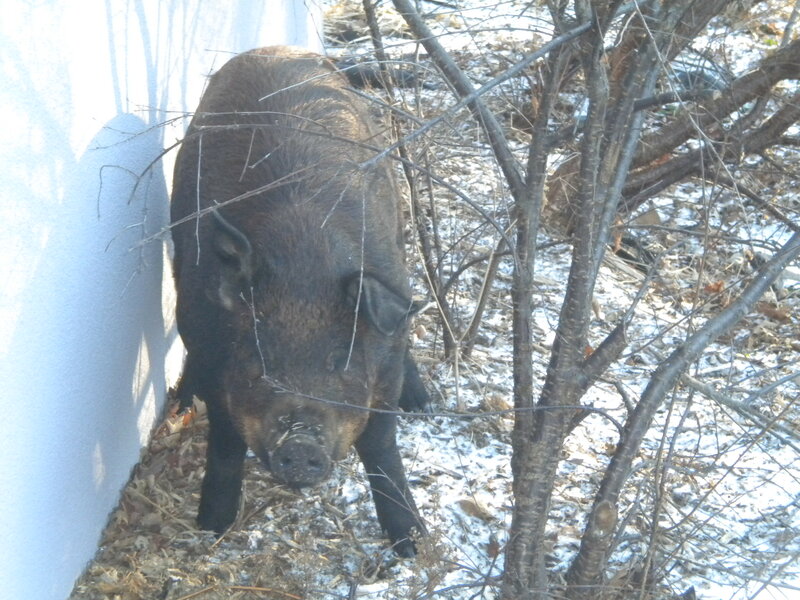 I wondered if the pig would like pasta? With kalamata olives and salami? Doubtless. And then I made the quick decision to press on and we faced each other – “it” snorting all the while as we made our approach as in a dream. Slowly, appraisingly, in sync. 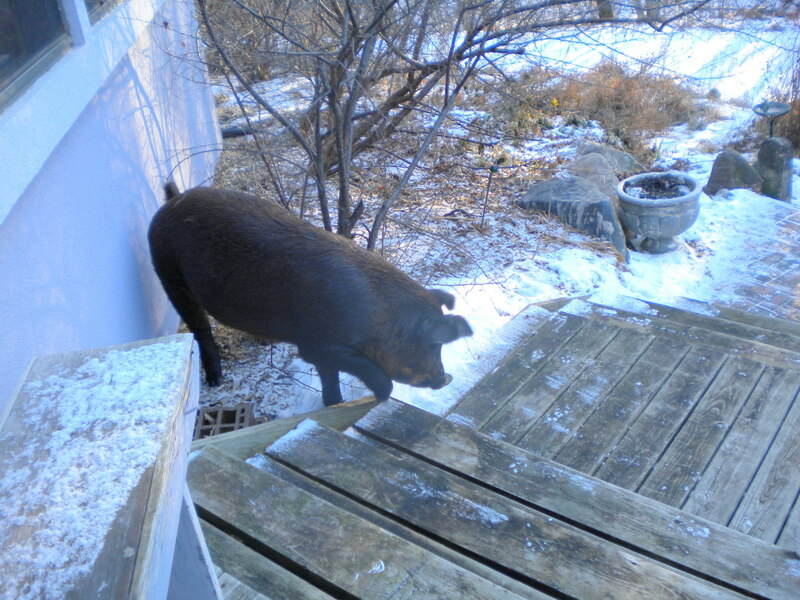 At the point we passed, the pig made a significant sniff at the swinging baguettes and then I was up the stairs and onto the porch and Katy was at the door asking if I’d met Dakota who was the official greeter that day. 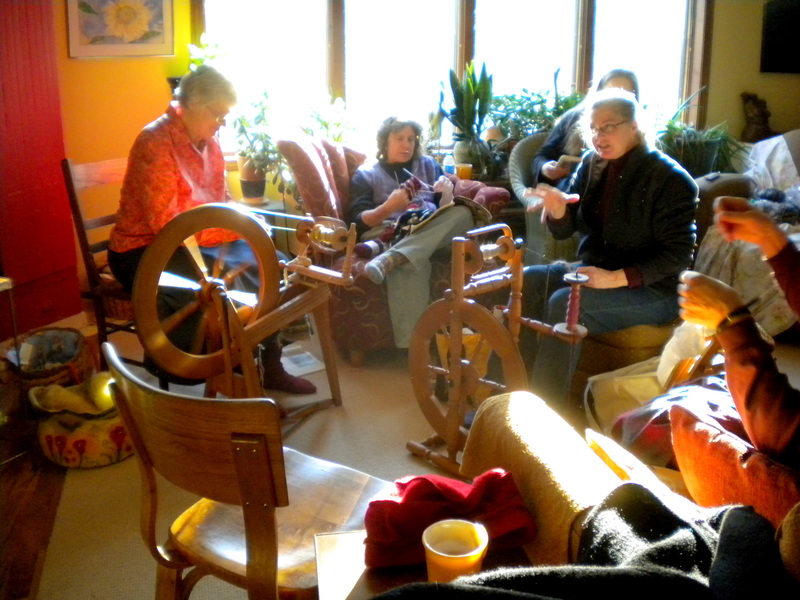 "This way to your car---"
Inside the house I found a circle of nine women gathered about – three spinning wool, the others knitting. And so the day went, mirroring I’m certain, what women have ever done, but not so much these days – talking, laughing, learning together. I had so much fun. And it seemed archetypal somehow. 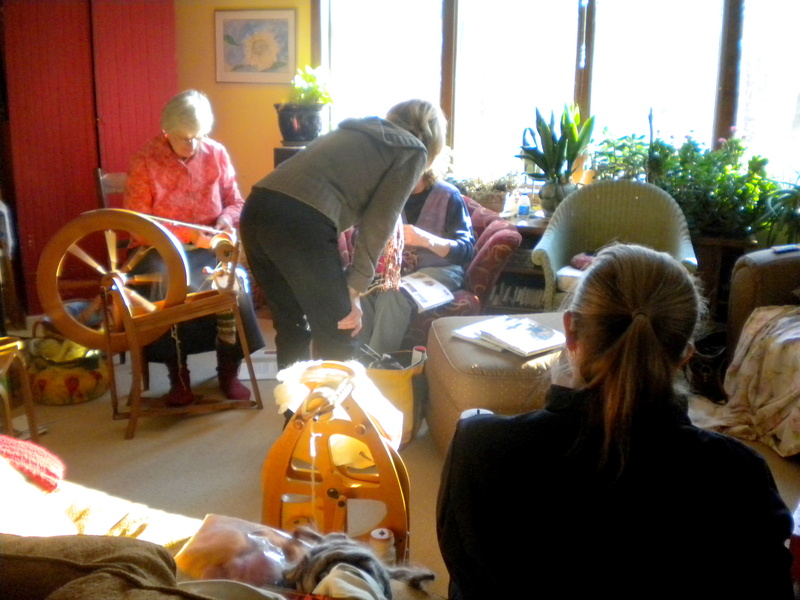 I could imagine the pioneer ladies of these prairies and woods, coming together for quilting and churning. Women everywhere who became charmed by their circle. 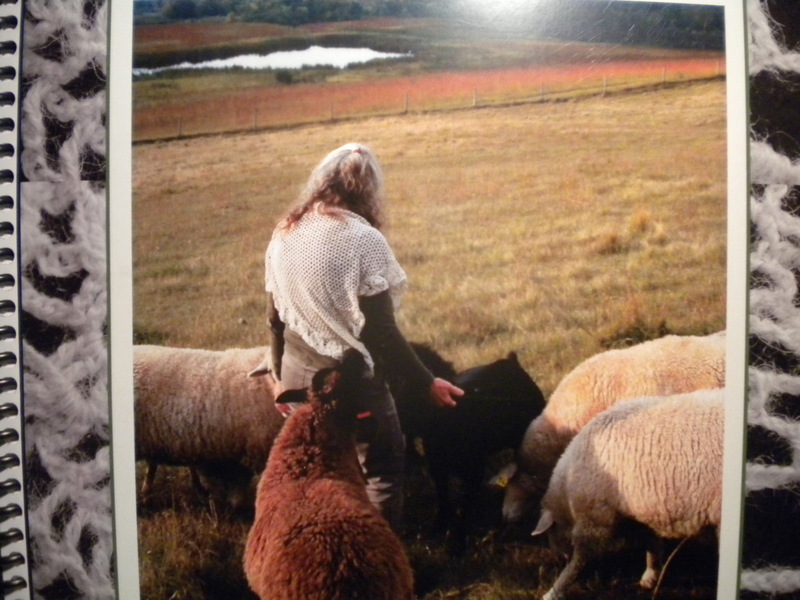 And if this wasn’t magic enough for one day, I met a real life shepherdess. 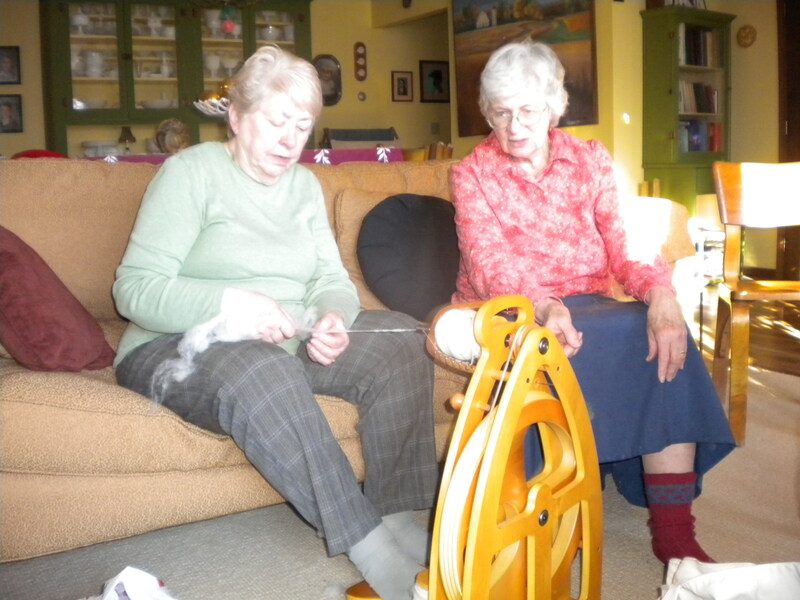 Joanie Ellison, one of that circle, lives in nearby Pelican Rapids, Minnesota, and hosts shearing events and is a part of Fiber Days twice a year and has written books – notably “Shepherdess, Notes from the Field” and “From Sheep to Shawl, Stories and Patterns for Fiber Lovers”. Yes, I’m a fiber lover and I’m now clicking and swishing my needles once again, wondering all the while just how much a spinning wheel will cost? This entry was posted in COMMUNITY, favorite things, friendship, minnesota life. Bookmark the permalink.